Nadia El Fani, both a politically engaged filmmaker and a political activist, has been visible throughout the Tunisian revolution and the ensuing election. Following a television interview about her film documentary in May 2011 during which Nadia El Fani expressed her secularist views, she was the object of an attack campaign by those who considered the film to be anti-Islam. The title of her documentary was changed from Neither Allah nor Master to Secularism, Inch'Allah (God willing) to minimise the controversy. 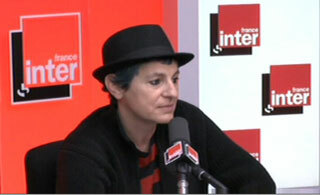 Today, 28 October 2011, she was the guest of Hélène Jouan of France Inter. She talked about the election victory of the islamist party Ennahda and its implications for Tunisia, the left and pro-secularists like herself. Introduction: The cineaste Nadia El Fani is the invited guest today. Good morning Nadia. It is official since yesterday evening that the islamist party Ennahda which lead with more than 40 percent of the vote in Sunday's election, not an absolute majority but are claiming to be the head of the new government. Are you surprised by the victory of the so-called moderate islamists? Well, I don't want to say victory, since they did not receive an absolute majority. But I am being honest when I say that the progressives were shattered by the outcome. I never would have imagined that they would have attained such a high percentage of votes. We will have to analyse the results to see what happened. It was a wake up call for the Tunisia of today about the conservative mindset of part of Tunisia. How do you explain this victory? Was it that the islamists were the first victims of Ben Ali which gives them a certain credibility among the Tunisians today? Of course that played a certain role as they made it clear that they were the martyrs of Ben Ali's tyranny. But perhaps also the left did not sufficiently show that they were equally victims of his regime, everybody was oppressed. Of course the islamists were oppressed en masse, perhaps blindly as everyone in the islamist movement was not involved in politics. It was viewed by them as an attack on religion and they took advantage of this. And the progressives who are pro-secularism like me, were viewed as being on Ben Ali's side, as they are all against religion. An easier target than to deal with what we stood for. Ennahda is attempting to reassure everyone, to demonstrate a moderate stance, ascribing to democracy by calling for the secular parties which came in second and third place to join in a coalition with them. Do you accept this moderate position that is presented? What does this mean to you? I don't believe that moderate islamists exist. I even call them anti-democracy. But yet they are taking a pro-democracy position! Yes, and before me there were others. Even under the Ben Ali regime we were the object of calamitous campaigns in those newspapers that we called "rags" at the time. The same journalist during the Ben Ali period...the so-called liberals are now at the service of Ennahda, one saw them on television--national and private, and read their articles in the newspaper. And after the infamous interview that I had, they were the ones who published a communique that was broadcast non-stop, dissociating themselves with me for merely stating that I was atheist. Unfortunately, it is a pity that one will do anything to get in power. And that if the left wants to contain the islamists they must always play the role of the opposition. As the left has always been, and the way it appears, will continue to be. and not be part of the coalition... and the 40 percent who voted? Yes, that is the question, how did it happen? In a year's time we will see if those unemployed think that Ennahda will be able to give them jobs. The lamb that they bought to celebrate Eid and the elections, will they be able to buy one every month? Will those who are hungry be able to eat everyday? That is not where the problem is. It is the construction of a country based on values--for them moral values, for us, universal ones. And in effect, it was for the left to show what values are to be constructed for today's society. The model for Ennahda today appears to be the AKP, the Justice and Development Party in Turkey, while conservative, they are looking towards economic prosperity. Could that not be the case in Tunisia. An Ennahda representative has already stated that there will not be restrictions on the beaches, on alcohol, both for Tunisians and foreigners. I would like to believe what they say, but based on the facts presented today--even during the campaign--not even elected they were able to prevent the release of a film such as mine in Tunisia which posed questions about secularism. That was proof that even before coming to power they were able to suppress our individual rights. What will it be like when they are in power? There have already been tensions starting last night by opponents of the rise of power of islamists, notably in Sidi Bouzid. Do you anticipate more resistance among these sectors--the anti-islamists and secularists like yourself as a result of the Ennahda victory, will Tunisia be divided again? The left is fundamentally democratic and will fight using political means and not resort to violence. On the other hand, the islamists, perhaps not Ennahda, though we have already seen the salafists at work, barely condemned by Ennahda. What are they going to do about the radical branch that elected them? Thank you Nadia El Fani. Just a reminder that your film [Secularism, Inch'allah] can still be seen in France, in Paris. And in Tunisia?